In a crowd full of iconic red baseball caps splashed with Make America Great Again, I found a shark – and I’m not talking about the newly-elected Trump or his cabinet. 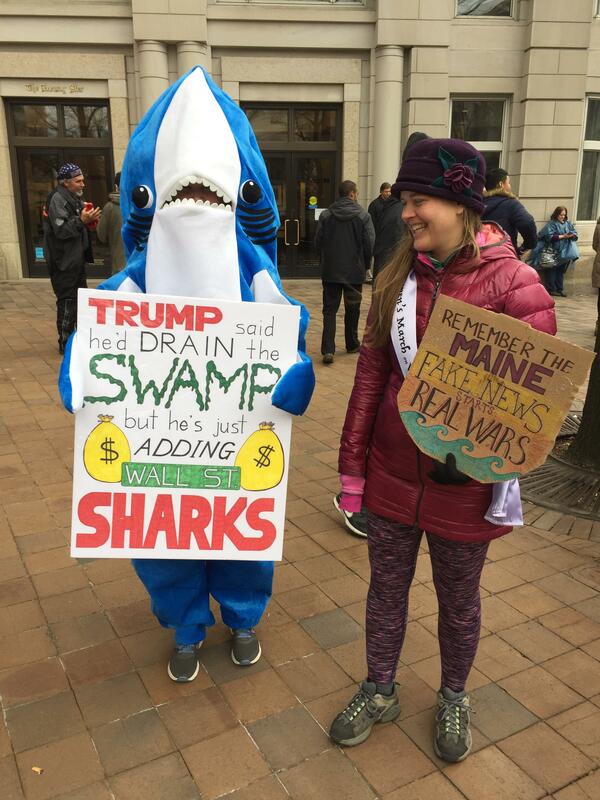 At the 58th Presidential Inauguration of Donald J. Trump, a woman in a hammerhead shark costume was spotted among the protesters feeling blue in a sea of red. “Trump said he’d drain the swamp but he’s just adding Wall Street sharks,” read her placard. A common trend of the day. I was stationed directly across the street from the Trump International Hotel in Washington DC, a stop along the inaugural parade route from where Trump and Pence would swan past later that day. We waited hours for his arrival – the parade was the last stop of Trump’s inauguration before the balls that evening, and after the swearing-in ceremony, the oath of office, and the inaugural address. We watched and waited in horror as Trump railed against the “American carnage” of Obama’s eight years, in an inaugural address described as “raw, angry and aggrieved.” It did not do much to heal the rift between the two halves of the country divided over his election. So when Trump stepped out of his limousine into the cold rain near his own hotel, not everyone there greeted him with a cheer. He gave the audience a wave. Dozens of protesters to my right yelled “Dump Trump” and dozens of supporters to my left shrieked “USA! USA!” The crowd was evenly split. The crowd was riled up. The crowd stood up for their beliefs. And where the two sides met, it got vicious. Verbal confrontations ensued about Trump’s sexual assault allegations, his stance on immigration, and women’s health. Both sides competed in several chant battles (most creative chant of the day: “Hands that small can’t build a wall”), while umbrellas and signs were thrust in the air to block the opposing sides’ view of the parade. 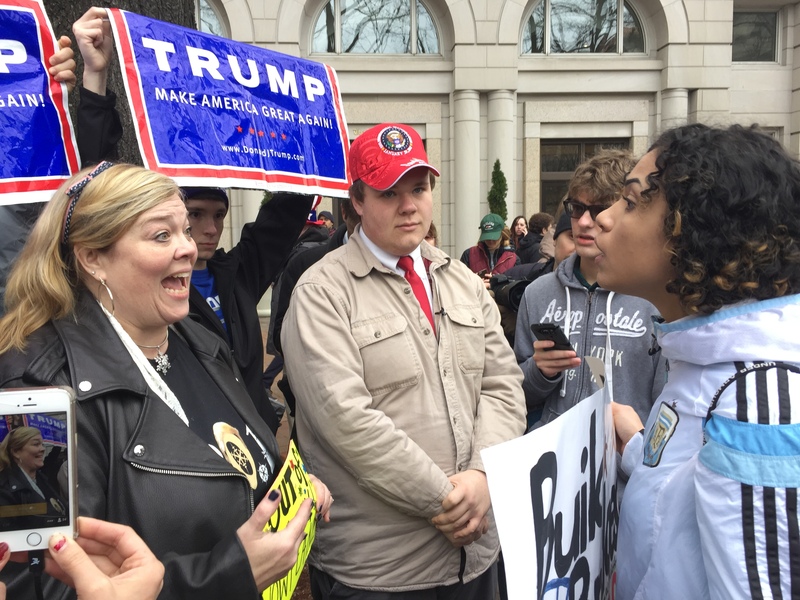 Throughout the clash, Trump supporters expressed their feelings that the protesters were being disrespectful to our new president. After several arguments with the opposition, protesters stood by a defence of freedom of speech and held their ground. 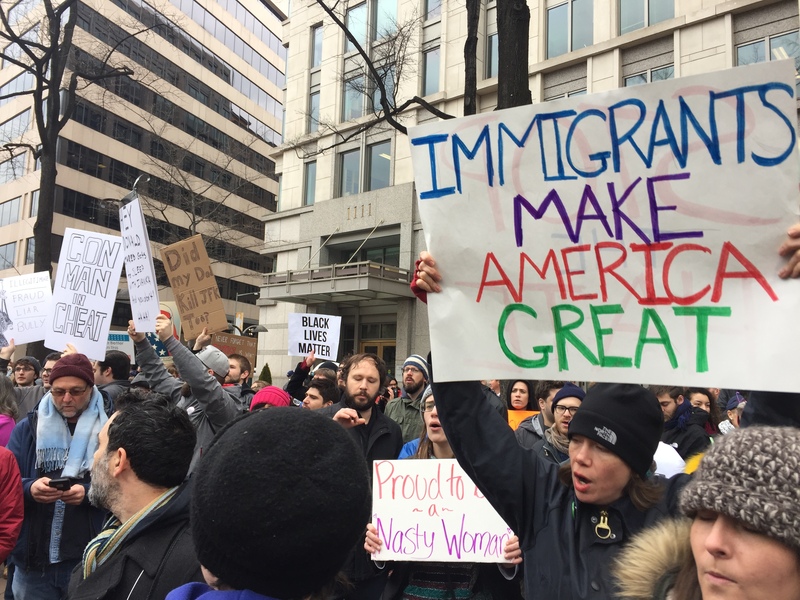 But even during this shark-eat-shark inauguration, many expressed the need to come together as American citizens over the next four years. After Trump crossed the finish line of his 30 second stroll down Pennsylvania Avenue, he disappeared into his limousine as quickly as the crowd headed for the exit. While Trump was en route to the White House, parade-goers left even more tense than when they first arrived at the crack of dawn.